We all know that breaded cutlets and chops, whether veal, pork, lamb or—that all American favorite—chicken, make for awesome eating. But did you know that vegetables can prepared as cutlets, too? And if you ask me, eggplants are the perfect veg for the purpose; they turn out round perfectly round cutlets, golden brown and crispy on the outside, meltingly soft on the inside. Traditionally categorized as an antipasto or side dish, Eggplant Cutlets can also serve as a light, vegetarian main course. Set up an ‘assembly line’ for breading the eggplant with three bowls or other shallow container. Fill the first one with flour, then the second with the eggs, beaten just until the yolks and whites are fully mixed, seasoned with salt and, if you like, the parsley and grated cheese. Finally, add breadcrumbs to the third bowl. Pat each eggplants slice dry, then dredge it in flour, followed by the egg and finally the breadcrumbs. Proceed gingerly—the breading easily ‘smudges’ off the smooth surface of the eggplant, especially around the skin. Shallow fry the breaded eggplant slices in enough oil to come up about 1cm (3/8 inch) up the sides of your skillet. Adjust the heat so the slices fry gently without burning—not too hot, or the outsides will brown before the insides have a chance to cook. Make sure the slices have lots of room for the oil to bubble up around them. Remove the slices as they are done and set up on a cooling rack or a platter lined with paper towels. The key to making Eggplant Cutlets is making sure the insides are fully cooked at the same time as the quickly browned crust browns. To achieve this there are a few tricks: To begin with, make sure to purge the eggplant with salt. This step isn’t always necessary but for this dish it really helps. Besides getting rid of any bitterness, it slightly soften the eggplant so it cooks more quickly and allows the breading to adhere better to the eggplant. Second, don’t cut the slices too thin or too thick. 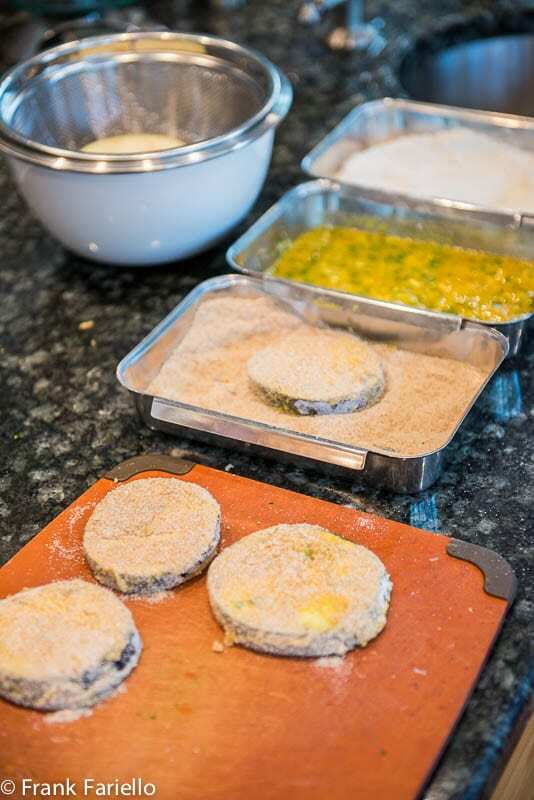 You want the slices substantial, to give them the look and mouth feel of actual cutlets, but don’t overdo it or the insides won’t cook properly—the 1 cm or 3/8 inch thickness indicated above should be about right. Finally, fry the cutlets at gentle heat, to give the insides a chance to tenderize before the crust browns. But here again, don’t overdo: if the heat is too low, your cutlets will come out soggy and greasy. And, as for any frying, make sure the cutlets aren’t crowded in the pan. To skin or not to skin? Most Italians typically don’t skin eggplant, and I never do. The skin adds some interesting color and tends to hold the cutlets together in a neat round shape. But sometimes very mature eggplant can have tough skins, so observe first and decide. But it’s better to look for younger eggplants anyway. You can make Eggplant Cutlets using only eggs and breadcrumb, but I find that dredging them in flour first helps the egg to stick to the eggplant. Equally delicious, but very different, are the fried eggplants and other veggies my grandmother made just with flour and seasoned egg and no breading. I’ve seen vegan versions of this dish made with a thin chickpea and water batter to replace the beaten eggs, but haven’t tried it so I can’t say how well it works. Eggplants Cutlets are delicious just on their own with a sprinkle of salt and perhaps a few drops of freshly squeezed lemon juice. But you can get fancy with them, too, for example by topping them with fresh tomato salad as you might a Milanese veal chop. Or for a more substantial meal, you can your Eggplant Cutlets them with slices of ham and fontina cheese and pop them under a broiler until the cheese melts. In some recipes, the ham and cheese goes inside the cutlet, as you would a costoletta alla valdostana, also delicious if a bit fussy for a lazy cook like myself. Set up an 'assembly line' for breading the eggplant with three bowls or other shallow container. Fill the first one with flour, then the second with the eggs, beaten just until the yolks and whites are fully mixed, seasoned with salt and, if you like, the parsley and grated cheese. Finally, add breadcrumbs to the third bowl. Pat each eggplants slice dry, then dredge it in flour, followed by the egg and finally the breadcrumbs. Proceed gingerly—the breading easily 'smudges' off the smooth surface of the eggplant, especially around the skin. That is actually a great vegetarian alternative that I have never really thought of, thanks for the suggestion, since I am trying to cut down our meat consumption! After all, everything tastes better fried! Frank – These are always a hit, no matter who is eating them. Even declared eggplant haters can’t resist these. You’ve made me realize I haven’t made them in a long time. Now that eggplant season is approaching, I will remedy that. uno dei piatti preferiti da mio figlio (e anche da me) credo un vassoio pieno non basterebbe per noi due ! Buon we Frank ! Tante graze, Chiara, buon weekend anche a voi! My Grandmother made these often and as children we looked forward to sampling a slice or two before dinner. Thank you for bringing back that memory. And thank you for your comment, Paula! I’m against the practice of salting eggplant/aubergine prior to cooking. It used to be said one had to do this ‘to remove bitterness’, if it was ever needed in the past we certainly don’t need to do this with modern cultivars. As Harold McGhee has pointed out, what salting actually achieves is to partially break down the cell structure of the vegetable and make cooking evenly through easier. As he also points out, a far easier way of doing this, and one which does not add salt to the food which means the slices have to then be washed and dried, is simply to precook the slices. One can steam them, but the easiest and most effective of all is to microwave the slices, spread out on a flat plate, on full for a minute or so then allow them to cool. With any kind of cooking that involves frying in oil, this also reduces drastically the amount of oil necessary (and absorbed by the food). ps: for not too oily “fried” aubergine cutlets I tried few times the CI technique of baking them in the oven, on a grate (for their parmigiana) and it does work/they are not as luscious as the ones described here by Frank though, to be hundred per cent honest.